Double X Science: Why Are Snowflakes Always Six-Sided? Why Are Snowflakes Always Six-Sided? It’s a well-known fact that all snowflakes have six sides. Or at least I thought it was. Why Google is unable to Google that fact and has on at least two occasions created a Doodle with an eight-sided snowflake is a mystery. What’s less mysterious is how scientists can be so sure that all snowflakes have six sides. Have we examined all snowflakes? No, of course not, but the explanation lies in two words: hydrogen bonding. Thanks to the intermolecular force of hydrogen bonding, all snowflakes have six sides, and hydrogen bonding also makes life as we know it possible. Now that’s an important bond. You can’t really understand hydrogen bonding, though, without understanding why water molecules are arranged like they are. Water seems like a simple enough molecule. It consists of one oxygen atom with two hydrogen atoms bonded to it. The hydrogen atoms bond to the oxygen atom at a distance of exactly 104.5 degrees from each other (1). Why that particular angle? An oxygen atom has a total of eight electrons. Two of them take up all the available spots in the shell closest to the atom’s nucleus. 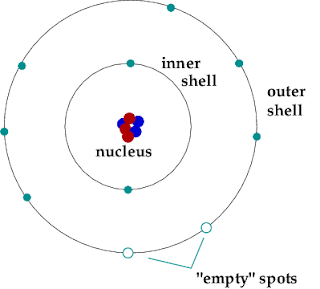 The remaining six electrons are relegated to the atom’s outermost (or valence) electronic shell. But this shell can actually hold eight electrons, so two spots are open. A hydrogen atom has one electron on its only electronic shell, and since that shell holds two electrons, it’s got room for one more. Because oxygen has two available spaces and hydrogen has one, oxygen can share that space with two hydrogen atoms. Both hydrogen atoms share their single electron with the oxygen, and the oxygen shares an electrons with each of the hydrogen atoms. The remaining four of the oxygen’s electrons aren’t a part of this sharing arrangement, though. Electrons kick around in pairs, so these four non-sharing electrons form two pairs. With these two pairs sitting alone and the other two electrons each sharing with a hydrogen, a water molecule has a tetrahedron (or three-sided pyramid) shape with four attachments emerging from the oxygen nucleus. Two of those attachments are electron clouds containing two electrons each (the pairs), and the other two attachments are hydrogen atoms with two electrons moving between the oxygen and hydrogen orbits. In a true tetrahedron, the attachments would all be 109.5 degrees from each other. With the water molecule, though, the hydrogen atoms are 104.5 degrees from each other because the two paired-electron clouds are grabby with space and force the electrons shared with the hydrogen atoms a little closer together. So we’ve learned that the hydrogen and oxygen form a covalent bond, which means they share their electrons. What I haven’t told you is that the oxygen is very grabby with that electron, so the sharing isn’t exactly equal. The oxygen has a stronger hold on the electron and is pulling that negative charge closer to it and away from the hydrogens. What results is a slightly negative oxygen and slightly positive hydrogens. The oxygen actually has two areas of negativity, right across from where it’s bonded with each hydrogen. 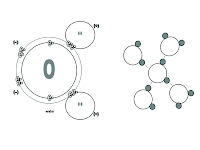 Water molecules can use these areas of slight charge to form a fairly strong bond with other molecules, a bond called a hydrogen bond. While not every molecule containing hydrogen can form this kind of bond with other molecules, molecules in which hydrogen is in this unequal sharing situation will be able to. 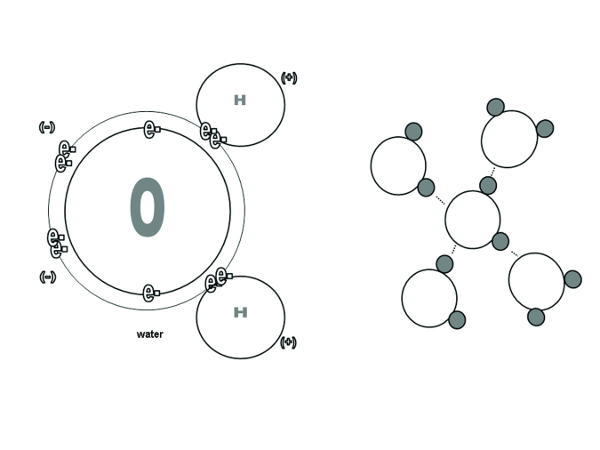 In the case of water molecules bonding to other water molecules, the two slightly negative areas of the oxygen can each bond with a slightly positive hydrogen from another water molecule. When all four slightly charged areas have each bonded with another water molecule via hydrogen bonding, the result is a tetrahedral (four-sided pyramid) shape. These bonds make water an unusual substance. When the temperature drops and water starts to solidify, the hydrogen bonding becomes very important. The hydrogen bonding dictates the shape of the ice crystals. You’ve learned that each water molecule is linked to four other water molecules in a tetrahedral arrangement. As the water freezes, these tetrahedrons come closer together and crystallize into a six-ring or hexagonal structure. Look at the image to see how this happens. Each point on the hexagon is an oxygen atom, and each side is a hydrogen bonded to one oxygen. As the water approaches freezing temperature, the water molecules continue to crystallize in this tetrahedral arrangement. But water does something unlike most substances. As it nears freezing, instead of continuing to contract, it expands slightly from about 4 degrees to 0 degrees Celsius as the motion of the molecules slows with the cold, and the hydrogen bonds extend the molecules to their fullest distance from each other. It’s like a ring of people holding hands, elbows bent, and then gradually straightening their arms to the fullest extension so that they’re at the greatest distance from each other. When water molecules do this, the hexagonal structure expands into a larger and larger hexagonal structure. The snowflake, with its six sides, is what results from this process: It is a large, gorgeous ice crystal. Ice crystals are like mineral rock crystals. The macroscopic (large) shape you see is dictated by the microscopic, molecular crystalline structure. Ice has a hexagonal crystalline structure, so a snowflake has a hexagonal structure. Sodium chloride, aka table salt, has a cubic molecular structure, so the salt crystals you shake on your food have a cubic shape. It’s interesting that hydrogen bonding causes snowflakes to be six sided (are you listening, Google? ), but it carries far greater consequences than beautiful snowflakes. Breaking those hydrogen bonds apart so that water can transform from liquid to gas takes a lot of heat, so the boiling point of water is much higher than it is for other, similar molecules. 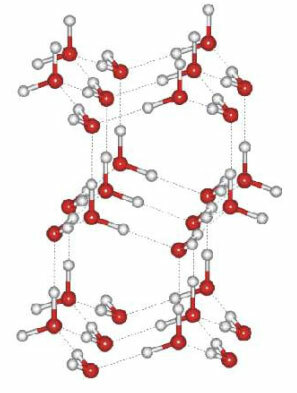 Based on similar molecules, water’s boiling point should be about -80 degrees Celsius (-176 degrees Fahrenheit) (!) instead of the 100 degrees Celsius (212 degrees Fahrenheit) it really is (1). And then there’s the fact that ice floats, which means that the solid form of water is less dense than the liquid form. It is highly unusual for the solid form of a substance to be less dense than its liquid. But because those hydrogen bonds force water into a pretty open, hexagonal crystalline structure as the temperature nears 0 degrees Celsius, molecules are not packed as closely together as they are at warmer temperatures. Think of those people holding hands, stiff-arming each other as far apart as possible. If they all started slam dancing, their handholds would break, and they could get closer to one another. Water molecules are a bit like that when the temperature goes above 4 degrees Celsius. When ice melts, some of the hydrogen bonds break, and the water molecules can be closer together. The far-apart water molecules in ice form a less-dense substance than the close-together molecules of liquid water, so ice floats in liquid water. This property of water is integral to life on Earth. When a freshwater lake starts to freeze, the ice floats on the top, insulating the water below and preventing it from freezing. The fish, plants, and other life in the lake remain alive beneath the protective and insulating icy layer. If ice sank instead, over periods of deep freeze during its 4.5 billion year existence, this blue planet would have developed an icy, inhospitable core. Instead, the fact that ice floats meant that Earth was a perfect incubator for life in its oceans. All because oxygen is just a little bit grabby with electrons. (1) Petrucci, Ralph H. (1989) General Chemistry (Fifth Edition). New York: MacMillan.